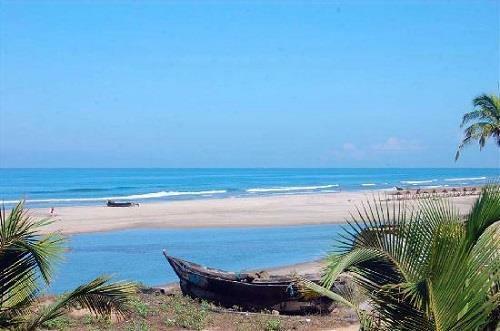 Arambol Beach in Goa is in a conventional fisherman village, situated approximately at a distance of a one- hour drive away from Dabolim Airport in the Pernem region of north Goa. This beach attracts a huge crowd of international tourists, especially during winter, which is between November month and March month. 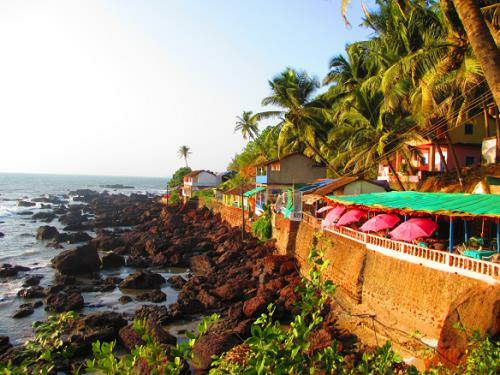 Arambol has its own bohemian atmosphere which is not much found anymore in all other areas in Goa like Calangute and so it inevitably draws many unusual travelers. This beach is known to be among the loveliest beaches situated in Goa, in all other famous locations such as Palolem, Anjuna and Vagator. It borders on the North with the Keri Beach and on the South with the Mandrem Beach. If you plan a trip to this section of Goa, you must not miss visiting this place. You can try out any shack here and you are sure to enjoy delicious food varieties and good service. This is the best, least crowded and cleanest beach in North Goa and also an apt and ideal place for peace seekers. The fewer crowds may be because it is a little far away from majority of the beaches in Goa, but it is definitely worth the visit if you need peaceful relaxation alone or with loved ones or close friends. There is a little shack that is almost hidden near Arambol beach and you can locate it by noticing a garden from the beach road of Arambol and by walking down towards the beach. You can order anything and you will find yourself desiring for more. It has the ambience of private beaches and it is also very beautiful. After reaching the Arambol beach, taking a walk along the path of cafes and shops will lead you to the area of the Freshwater Lake. If you visit this beach, you must try a swim in this freshwater lake. You must also try out Shiva Cafe at the lake side which serves scrumptious food. At present, there are no main hotels in the area due to the efforts of local people who have effectively campaigned protesting against building any key hotels on this beach. The major types of accommodation here are home stays, houses, transitory beach shacks and guest houses, which are set up every year at the tourist season‘s beginning and then removed at the tourist season’s end. Locals have rightly enforced norms to be complied with, giving importance to environment friendly activities ensuring that the beach and its adjoining places are free from filth and garbage. There are rooms available for reasonable rates as compared to other tourist filled beaches like Candolim and Baga, though prices in these beaches increase every year in a fast manner. Most of the people here are Hindus, followed by a minor percentage of the population who are Christians and then the Muslim minority. The Church of Our Lady of Mount Carmel is a favourite among the Catholics in this area and Mother Mary in the Konkani language is named as Saibinn Mai. Similar to many other places in Goa, both cricket and football are popular sport activities among the people in this area. By taking a little walk to the north of the primary beach is another smaller beach and freshwater lake near the sea containing invigorating hot water, making this the perfect spot to relax. The water in this spot is a combination of sea water and fresh water. There is a jungle valley in between the low hills hiding an impressive Banyan tree. Close to this banyan tree is a sculpture of stone carved by Jacek Tylicki, an American Land artist and Conceptual and this stone is named ‘Give if you can - Take if you have to’ and another name is ‘The Money Stone’ which has evolved into a pilgrimage place. Contributed by the music compositions of national as well as international musicians, this beach holds live and rich music scenes, led by the Gypsy-Fusion bands. Parts of these vibrant scenes are different styles of dance, live music, healing arts varieties, meditation, and Yoga drawing visitors from every walk of life. Arambol beach is increasing in fame at a greatly fast speed and the prices are also rising here for food, rent, real estate and other services. Strong winds in the main seasons make this beach the ideal place to indulge in leisure sports, such as Kite Surfing and Paragliding. Many different practitioners in healing art forms provide courses in meditation, Odissi Dance, Yoga, and also in Western musical instruments and traditional Indian instruments such as Sitar and Tabla. The InJuCo (Indian Juggling convention), Goa Contact Festival, In-Touch Festival and Tribal Dance Festival are the popular events held here. Both the In-Touch Festival and the Goa Contact Festival provide Improvisation programmes in dance and they are scheduled during late January or early February. The beach is quite safe during the daytime, with not many crime incidents reported. There are however, some Male so-called "ear cleaners" who offer their services but ultimately dupe the visitors, sometimes also causing severe ear infections later, so beware of them. Crimes occur especially in the major tourist seasons from the months of November up to March and the well-known crimes are "firang fishing", that is, burglars using long poles in order to steal valuable items through windows as well as "apple picking" in which the targets for stealing are laptops and iPhones. So, while having a good time at the beach, it is also advisable for you to keep your things very safe. The Ministry of Tourism of Goa has established Life Guard facilities just at the center of this beach (about 3km to the south of the primary stretch of water), since the calm water attracts unsuspecting visitors who eventually get into trouble due to the strong currents. Many restaurants and cafés have mushroomed throughout the shoreline, starting from the little "Sweet Water Lake" beach till Mandrem. During the tourist season, plenty of traders from across India go to Arambol beach for selling their merchandise and goods. So, do plan a trip to this lovely and lively beach along with your loved ones, for some fun time together!